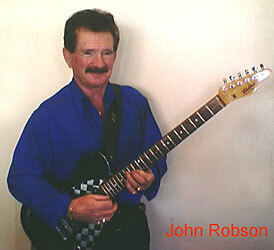 JOHN ROBSON was born in Scotland and he 'discovered' Australia and learnt to play guitar while in the British Merchant Navy. He returned here in 1957 and became a vocal recording artist, appearing on many radio and TV shows. These days he is a fixture in the entertainment scene around Wagga Wagga. written by Ace Fender, a track that comes from John's 1999 album About Loving You . The album was produced by Glen Bain and co-produced by John. This track features guitar and bass work by Glenn, pedal steel by Michel Rose, fiddle by Marcus Holden, piano by George Boyer, drums by John Robson Jr and harmony vocal by Wendi Jackson. It was engineered by Ace Fender at Ace Recording Studio and mastered by Bruce Sheldrick at Digital CD Mastering.